Emily and George belong in that fantasy land where anything is possible, where language is universal, sometimes without words but always with understanding. A time and place where pets can enter without question. A land and time of make-believe which lasts for a few precious years and returns only in dreams. Adena Trevor was born in England, moved to Scotland when she was four. She lived in Rosyth, Fife, and was educated at Dunfermline High School. She took her Nursing training in The Western General Hospital, Edinburgh this was followed by Midwifery training in London. She emigrated to Canada, worked for the CBC in the Information Services. In 1967 moved to Ajax, Ontario where she worked as an RN in Ajax & Pickering General Hospital. When she resigned from A&PGH; she took up holistic nursing which she still does on a part time basis. 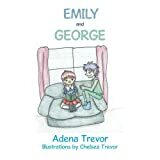 Adena is married and lives with her husband Stanley, has two sons and three grandchildren.Her Granddaughter, Chelsea drew and painted the pictures for this book.